On my last visit to Thailand I stayed in a beach shack with a soap-eating rat that seriously threatened my hygiene. The only silver lining of my four legged friend’s addiction was that I convinced myself his getting lathered actually meant he was house trained. So, two years on, disembarking from a champagne-fuelled business class flight destined for two of Phuket’s most sought after hotels, I was feeling rather chuffed with my latest set up. Unfortunately, the last two years have not been as kind to Thailand, which has suffered at the hands of everything from SARS and flooding to a military coup and of course the tsunami. And, whilst aftershocks of such bad press are still being felt in Bangkok, the only thing flooding Phuket is tourists. Initially put on the map for its tin mining, today the ‘Pearl of the Andaman’ is better known for its golden beaches, swaying palms and colourful nightlife. During my visit alone there were 42 new hotels being built to cope with the demand, however, the best locations were snapped up by savvy hoteliers long ago. Along the island’s western coastline, sand is like gold dust with many beaches packed to the rafters with military style lines of sun beds and surrounding traffic. 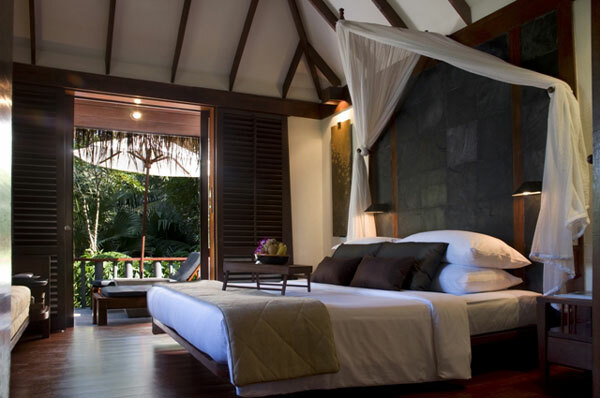 However, just half an hour’s drive from the airport lays a blissfully peaceful sandy stretch, hidden amidst a steep coconut plantation, hugged tight by a five-star hotel at either end. This is Pansea Beach, which doesn’t exist on most tourist maps of the island and the only access for non-hotel guests is by boat, resulting in a little bit of calm amongst the storm. 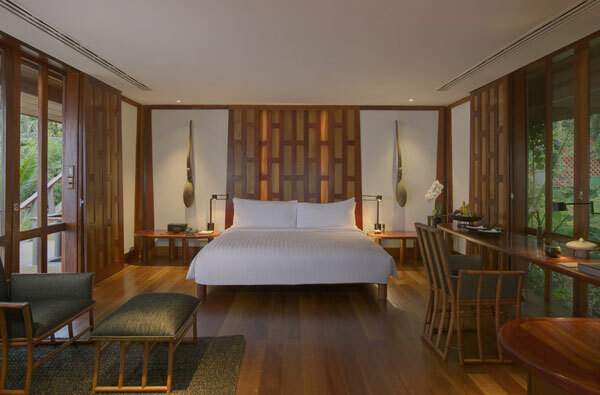 My first pit stop was The Surin, despite being a relatively large establishment with 105 rooms, it manages to cultivate an intimate feeling by nestling its smart cottages within the steep coconut groves. The hotel combines loyal staff that have been welcoming guests for years, and a chic new look, having been given a complete redesign by acclaimed Paris-based interior designer, Ed Tuttle. The main focus point of the hotel is the dramatic black tiled swimming pool which acts as a mirror as night sets in, reflecting the moon and surrounding palms beautifully. I was staying in one of The Surin’s idyllic beach cottages; isolated from the main hotel, my large sofa-clad balcony looked out across the quietest part of the photogenic sandy bay, making it the most relaxing place to enjoy a sun-downer. Surprisingly, despite being only a short drive from the controversial capital of Patong, this part of the coastline shuts down at 10.30pm, leaving you with only the sound of the waves lapping the shore and the spectacle of fireworks and lanterns rising in the distance after dark. On my first morning, I threw open my balcony doors and vaulted onto the golden sand beneath; I was one of the luckiest tourists on the island and I wasted no time heading straight off to explore further along the beach. I soon found a host of water sports, including kayaking, body boarding and Hobbie Cat sailing on offer. Feeling like a Bond girl, I precariously jumped on one of the jet skis and after convincing the concerned owners that I would not smash it straight into the rocks, I headed out to spy on the two super yachts moored within the bay. This place may not be on tourists’ maps but it certainly hasn’t escaped the attention of the international jetset. After circling a £120m super-yacht several times, humming the theme tune of Goldfinger and deciding that no, I wasn’t brave enough to fake drowning to get rescued and taken on board, I shot back to shore to relax at the hotel with a coconut (well, when in Rome). As well as water sports, a cluster of palm trees near the hotel are home to a makeshift massage area, with local Thai women offering hour-long massages from just £8. As a serial spa trekker, I couldn’t resist trying them out, but unfortunately you get what you pay for and it wasn’t a patch on the massage I had in the hotel’s spa, which sent me nodding off and dreaming of Daniel Craig and I on our super yacht. 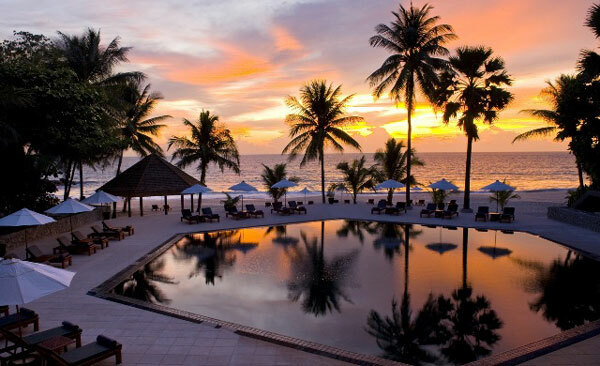 Having been stretched and pummelled into a suitably dreamy state, I headed to the hotel cocktail bar to see the sunset melt into the ocean, the swimming pool coming to life reflecting the silhouetted palms. The house cocktail’s chilli kick soon woke us all up and I could not fight the allure of Patong any longer (“Honestly Jess, it’s so much fun, there are three streets; one for men, one for women and one for… confused!” Hmm, how could I refuse?). The less said about this night the better, although I must say with so many pole dancers and ‘lady boys’ about, I was baffled by the men clogging up the tables playing Connect Four at every bar! I couldn’t get back to The Surin and its peaceful Pansea Beach quick enough. The next day we were heading to the other end of the beach to experience Amanpuri. 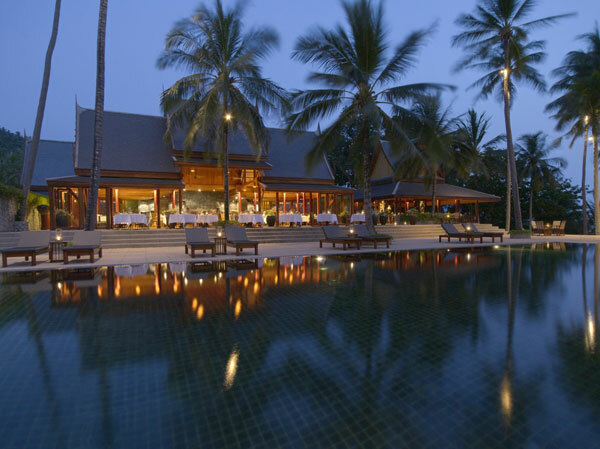 Many people agree that it was this flagship branch of the prestigious Aman Resorts Group that put Phuket on luxury travellers’ radars. Greeted with warm smiles and fresh jasmine flower garlands, the girls and boys were split up and whizzed off to separate villas by buggies. And boy what a villa it was…With a dedicated team of live-in staff available 24 hours a day, a 25 metre private swimming pool overlooking the glistening Andaman Sea and a bedroom to die for, the boys were green with envy. 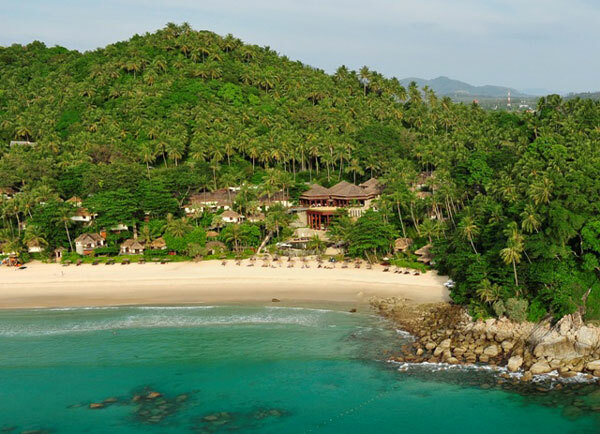 Set over 77 acres of former coconut plantations, the hush-hush hotel has played host to an array of billionaires and superstars which my trusted source (Google) reveals to be the likes of everyone from Prince William to Kate Moss, and it’s no surprise its chic design makes it Matthew Williamson’s favourite holiday hot spot too. With 500 staff to a maximum of 300 guests, nothing is too much trouble for this dream team. When I asked what the strangest guest request had been, they looked at me dumbfounded. “No tigers or gold plated taxis then?” I joked. “Well yes, obviously the odd tiger and elephant when they do not want to get involved with the crowds at the zoo,” the villa manager replied, as if that was a given. I stifled a shocked giggle. After a relaxing two-hour spa treatment, we made our way back to the villa to find our swimming pool alight with candles nestled in elaborate displays of floating lotus flowers. 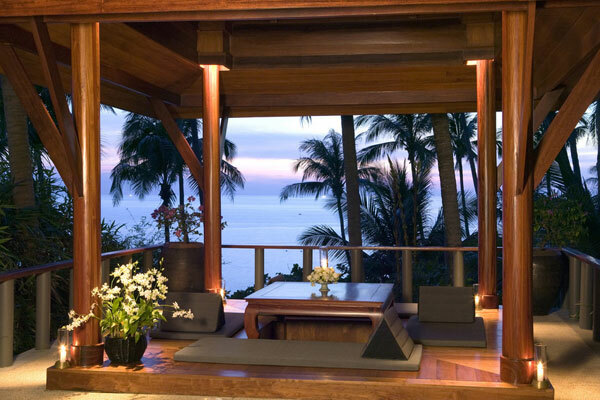 The walkways glowed with tea lights and a Thai banquet was awaiting us at the al fresco dining table, overlooking the fireworks and with lanterns illuminating the night sky further down the coast. I felt like I was gate crashing a millionaire’s wedding dinner, but no, it was all for us! The next morning, with slightly foggy heads, we set aboard one of the hotel’s fleet of yachts, Sealion, for a private tour of the Phang Nha Bay Marine National Park, located between Phuket and the Malay Peninsula. Carrying a maximum of six passengers, we escaped the usual tourist trail, setting our own itinerary and dipping in and out of the minty green water’s vast limestone islands at leisure. Our captain led us first to Ko Phang Nha, home to a family of crab-eating monkeys which dance along its limestone cliffs. Here we jumped on our private speedboat and headed towards a worryingly small cave. We all got to know each other a lot better as we jumped to the floor, heads in armpits, feet jabbing ribs, desperately avoiding the hanging rocks overhead. The contortion was all worth it as we came out the other side in an emerald lagoon filled with sweaty tourists looking pretty peeved in their kayaks, having paddled in the blistering heat to get there, only for us to motor in looking rather smug. Next we sped off piste through the mangroves and found an empty cave adorned with ancient paintings and sea eagles swooping overhead. A short ride away lay Ko Ra Ya Ring, home to a small community of sea gypsies who live in colourful shacks on stilts. Miles from civilization, they have their own school and make a living from fishing and the huge restaurants which tourists now flock to by kayak and boat. At night they shut up shop and return to their isolated life, surrounded by the beauty of the national park. Slightly depressing that their commute is less than mine! With the Bond theme tune still trumpeting loud, we sped towards the renamed James Bond Island, as seen in The Man with the Golden Gun. Backed by jungle, part of its coastline is unsurprisingly open for trade, with various shacks selling Bond themed souvenirs. Our exclusive trip included this on its itinerary but managed to avoid the enormous boat trips and armies of kayak tours, instead shooting off through the mangroves towards lesser known islands and more hidden lagoons before returning to Sealion for an amazing lunch. We sat in awe as the team delivered plates overflowing with grilled king prawns, fresh seafood salad, tender beef steaks, juicy lamb chops and spicy chicken fillets from the minuscule onboard kitchen. After a quick dip, we made our way back to Phuket Ao Po Grand Marina, slipping in and out of an overindulgent calorie induced coma. After a quick rest, we were led down to the beach for a barbecue with a difference. Greeted with a glass of chilled champagne, we abandoned our shoes and walked barefoot along the candlelit beach to survey the goods. The first table played host to a prime leg of jamon pata negra de belota, delicious salads and cheeses. The second had an enormous canoe-like bowl overflowing with the finest shellfish; sweet Phuket lobster, scallops, oysters, crab and giant king prawns that looked like they had been reared on steroids. Next was the barbecue station with tenderloin steak, wagyu beef and Canadian lobster all waiting to hit the grill, and last but not least the fish selection; a table of crushed ice displaying yet more lobster and an impressive selection of local fish. 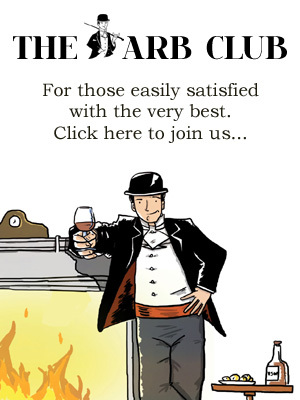 As I finished my champagne and lobster and beckoned the red wine and wagyu beef, my feet playing in the sand beneath me, I realised I had finally reached Double-0 Heaven. 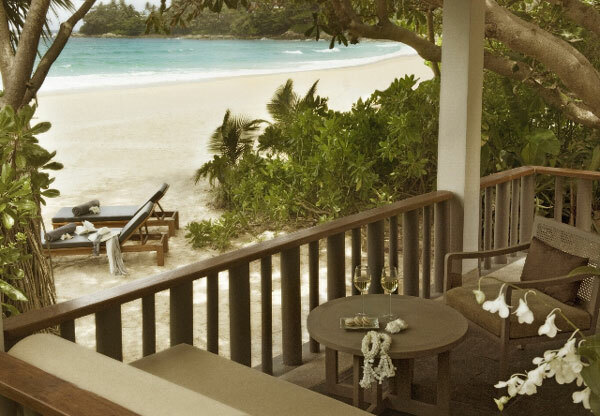 Just booked up Aman! Looks amazing, can’t wait!